Ben Curry of Bad Dice fame ran a painting competition this past month to celebrate the launch of the new White Dwarf magazine. 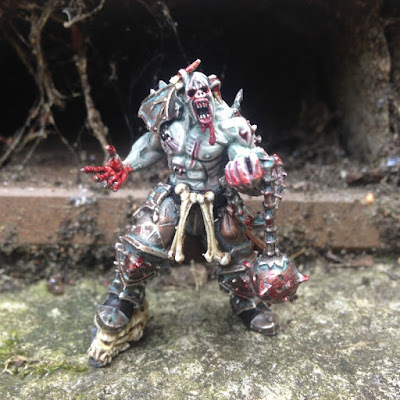 Everyone had to paint the same model, the free Slaughterpriest that came with the issue, but were allowed to do anything they wanted with it. There are some truly stunning entires in it, but the one that caught my eye the most as this Tzeentch conversion by elfhead. 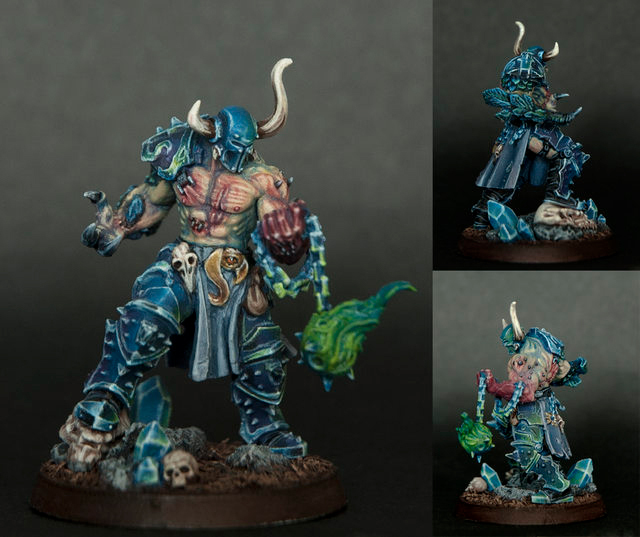 He didn't just slap a Tzeentch symbol on the model and call it a day, instead he did a pretty extensive conversion. The loin cloth is completely new, as well as the right arm, and the horns on the head. The most impressive part to me are the flames coming off of the flail. The sculpting and conversion work is pretty much flawless and looks like it could have been a stock model, which to me is when you know they did a great job. It perfectly evokes the imagery of Tzeentch as well, complete with feathers on his mutated arm. The painting on this is pretty great too. I love how the armor has a magical green sheen to it even though it's blue. They have even managed to work green into the skin without it looking weird. 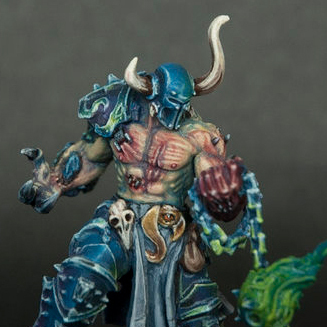 The green flames are a particularly strong part of the model and definitely draw they eye. The use of red on the raw wounds really stands out against the blues and greens of the rest of the model and is a really nice spot color. The addition of magical crystals to the base is really just the icing on the cake. Like I said though, there are a ton of great entries, with this Ghoul conversion by Age of Erstwood being another favorite of mine. You should definitely check out all of the entries and vote for the one you think should win below. Be sure to check out more of the fantastic entries in this painting competition here, and vote for your favorite here on The Grand Alliance Community.